The average size of a Costco warehouse in the US is roughly 150,000 square feet. You could spend an afternoon shopping and still cover only half of the store. Now think about how big 500,000 square feet is, that’s the size of the monstrosity of a greenhouse going up in the Palm Desert. Roughly two-thirds of the building will be canopy space, and they have plans for another building half as big to go up behind it. The scale of the industry that is starting to emerge from the legal cannabis landscape in California after only a year is exciting, to say the least. In this kind of market innovation is the key to success. 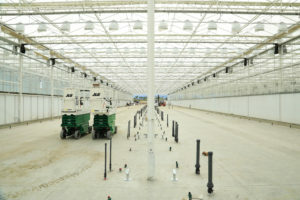 Earlier this month we visited a large-scale indoor grow that had tuned their setup so efficiently they were producing water. They filled their water barrels six months ago and since then they’ve had to dump water. Dehumidifiers pull clean distilled water out of the air faster than their plants can soak it up. We expect to see more facilities follow this trend along with clean energy solutions in order to stay ahead of margins that seem to tighten by the minute. Out in wine country, we’ve spotted operations gearing up to plant cannabis in the very same soil they had used previously to grow their grapes. 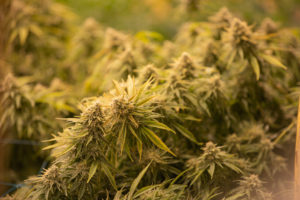 These farmers are coming from a rich history of agriculture to start pulling THC out of the ground and fuel the consistent demand coming from extraction labs strewn throughout the state. It is a different model than you see up north in the Emerald Triangle. It isn’t quite like the technique that has been passed through generations of Cannabis growers, but they certainly have what it takes to grow a crop that will turn into potent oil. Using the right genetics and farming tech they’ll be able to pull multiple crops in the same amount of time that it would take to grow the average full-sun flower. For many of these producers, 2018 has been a proof of concept. We expect the industry to continue scaling up as concepts are proven and taken into effect. A major concern for many craft farmers will be if large commercial farms can produce at a quality that is competitive with the smaller farms. We believe that concern is still multiple years off, but it’s a very real concern. We believe there will be room for both types of businesses, but the downward price pressure will be a tough pill to swallow for many small farms. At the end of the day, it’s nice to see farms that are focused on responsible growth and sustainability. Zero THC – What’s the point?